Participants in the 2013 Adirondack Donegal Beard Contest are shaving their facial hair in preparation for growing their Donegal Beards for this year’s contest to grow the best Irish beard. 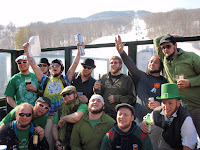 New beardsman are welcome to take part in the event, which will be held in North Creek on St. Patrick’s Day and is free and open to the public. The Donegal Beard (also called a Chin-curtain or Lincoln) is a beard that grows along the jaw line and covers the chin – no soul patch, no mustache. Contestants must be clean shaven on or after January 1st. There is no registration necessary. In 2012, more than 20 men participated in the annual beard contest, now in its fifth year. This year’s contest will take place 4 to 7 pm on St. Patrick’s Day, Sunday, March 17th, at Basil &amp- Wicks, Route 28, in North Creek, NY. Judging, which is based on Length, Fullness and Style, will begin at 6 pm- prizes will be awarded. There will be beer specials, live music, and corned beef and cabbage. 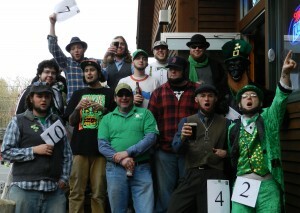 Photo: Contestants in the 2012 Adirondack Donegal Beard Contest, held at North Creek.